Since I tend to stay in OS X on my iMac the only real reason i boot into bootcamp and Windows 7 is when I need to do something in Alibre Design. Unfortunately Alibre is Windows only and from what I gather (please correct me if I'm wrong) they have no plans to port it to other platforms. Not that I blame them - it's generally a huge task to convert a program from Direct-X to OpenGL. Especially when you have tons of legacy code. So today I got my fill of jumping back and forth between OS'es so I thought it was time to check out Inventor Fusion for Mac by Autodesk. Luckily they have a free technology preview of this software which I installed it a while ago - just never got around to test. First impression of the user interface was good, although a bit more simplistic than Alibre, followed by the obligatory; "how do I do this and that in this software". After a couple of quick-run-through videos on YouTube courtesy of Autodesk I had a rudimentary understanding of the software. 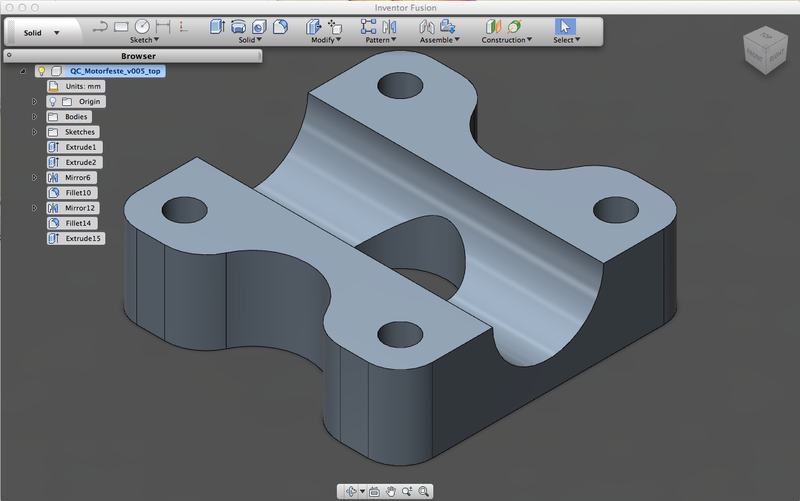 Upper part of outrunner motor bracket designed in Inventor Fusion. Although some operations are a bit tricky I think it's more about figuring out "the correct procedure" to get stuff done so by playing around with it a bit more I think the overall experience is going to get better. Since this still is a technology preview it crashed on several occasions, which is to be expected I guess, even though the operations I did were on simple objects. It even corrupting my scene file, but yet again my (paranoid?) habit of saving new versions paid off so no big loss. Over all it is much faster to fire up Inventor than booting to Windows so I think I'll stick with it, at least for simple objects, for now.